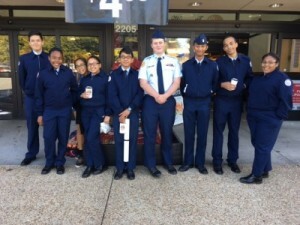 More than 500 JROTC Cadets in DeKalb County School District will raise awareness and contributions for The Empty Stocking Fund, an Atlanta-based non-profit organization that provides gifts to more than 50,000 children living in poverty each holiday season. The partnership with JROTC is a long-standing tradition that dates back to the 1920s. Last year the JROTC Drive raised nearly $90,000 for The Empty Stocking Fund, enough to provide gift packages to 4,500 children. The DCSD JROTC Cadet program is an extension of the district’s Career, Technical and Agricultural Education (CTAE) program. Through its Family2Family project, WSB-TV will support the cadets’ efforts by increasing awareness of the program and as one of the project’s underwriters Kroger will allow the cadets to fundraise on site at more than 50 metro area stores. If you see a cadet in your neighborhood this weekend, please support their efforts to help others by making a generous contribution! You can also donate online at www.emptystockingfund.org.